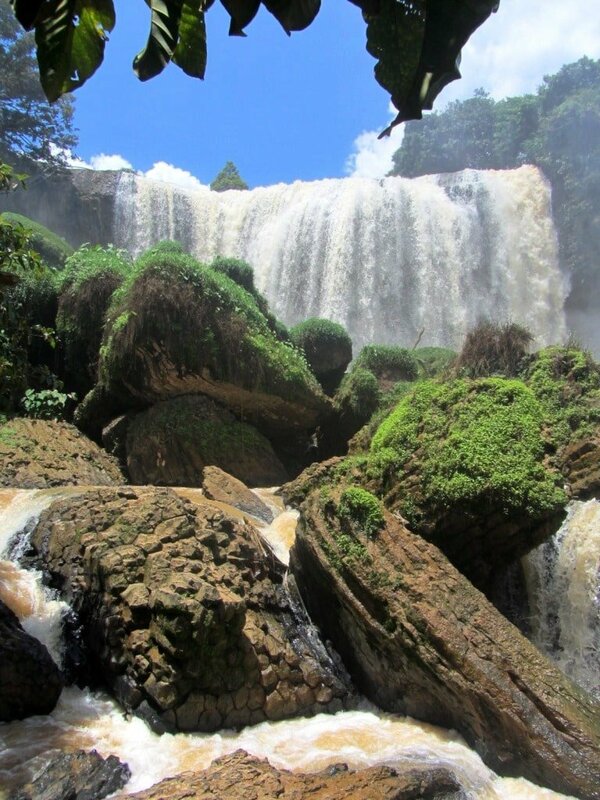 Elephant waterfall is in a heavily farmed valley at the bottom of a mountain pass, 30km southwest of Dalat. It’s a popular excursion for travellers on Easy Rider tours around the Central Highlands, which means there are some trinket stores around the entrance with mildly aggressive owners trying to lure you in. However, in general the tourist tat is pretty tame here – including several concrete toadstools, trampolines and overpriced rice restaurants – and once you’re passed the entrance (free, despite what ‘tourist poachers’ might tell you) you’ll be left alone to tackle to precarious route down to the falls. A blue handrail has been secured into the rock to help guide visitors along the rough, slippery and, frankly, treacherous pathway, which consists of moss-ridden stones, steps cut into volcanic rock, and muddy paths. It only takes a few minutes to traverse, but you should be extremely careful and watch your footing: the spray from the falls makes everything damp and slippery – I saw plenty of young, able-bodied men and women in their twenties scrambling down on their backside. But persevere, because, even as you make the descent, the roar of the falls behind you lets you know that the climb will be worth it. Once at the bottom, look up through the tangled branches, vines, and spray to see the towering waterfall rising over 30 metres high. 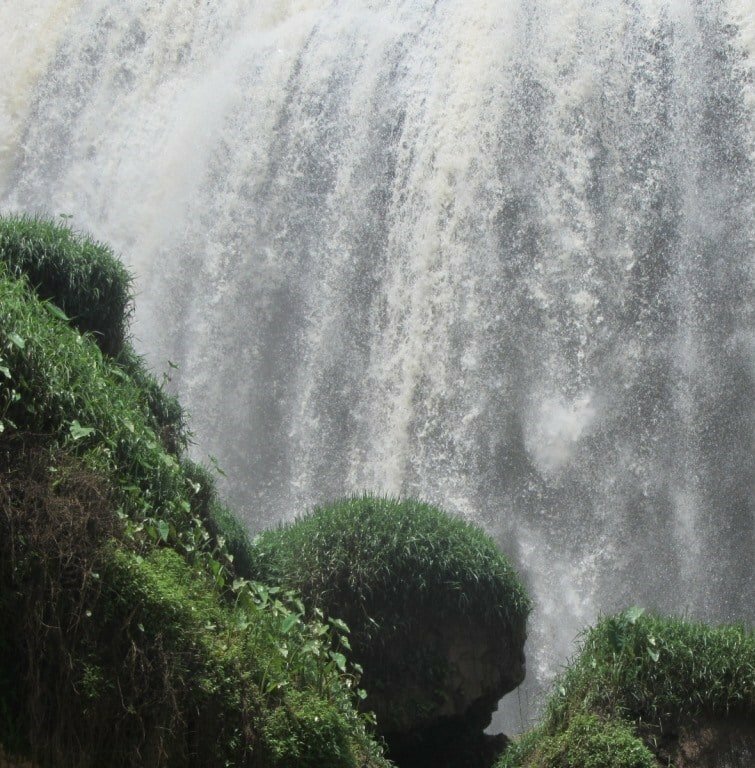 These falls are by no means the biggest in this list, but, because they are viewed from below, the scale, power, and volume of water appear far greater than they actually are. The giant boulders lying midstream are a great place to stand and admire the torrent (although you’ll get very wet in the process). Elephant waterfall the most dramatic in Lâm Đồng Province. There’s a great little coffee shop to the left of the entrance as you come in. Run by Dương, a young man from the north, Reng Reng Café serves excellent western-style coffee at reasonable prices. All their coffee is made using arabica beans from Lâm Đồng Province: you can buy a bag of the beans here to take home with you. Getting to Elephant waterfall from Dalat is fairly simple. Take Hoàng Văn Thụ Street west from the city centre and turn left (due southwest) at the signpost for Tà Nung village. At Nam Ban village (a few kilometres beyond Tà Nung) there’s a sign on the right to the falls, just before crossing a bridge over a river [MAP]. You can hire your own transport from Dalat (it’s a nice drive by motorbike) or find a local bus to Nam Ban village. The journey takes 45 minutes. This entry was posted in ALL, Central Highlands, Dalat, DESTINATIONS, Waterfalls and tagged central highlands, Dalat, elephant, guide, thác voi, travel, Vietnam, waterfall. Bookmark the permalink. Thanks for the price update. Reng Reng Café serves the best quality coffee we have had in Vietnam! The beans are farmed in Dalat and roasted in the shop. We also enjoyed the look and feel of the coffee shop. To all coffee lovers: it is worth going all the way to the waterfall just for this! Thanks, Tom, for writing about it first!! Yes, it’s great coffee 🙂 I’ve only been a couple of times, but I’ll be at elephant falls again in about a week, so I’m looking forward to tasting Reng Reng coffee again.